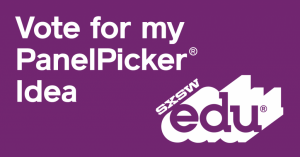 Don’t forget to pick our panel and vote us onto the official SXSWedu 2016 line-up! Contrary to what we may want to believe, emerging research indicates that use of digital tools and content within learning is not gender-blind. While girls and boys share a common interest in technology to support personalized learning, their uses of and aspirations for digital learning are often quite different. This is especially true with game-based learning. In this workshop, we will roll up our sleeves and interact with a variety of games that are popular in education. Using a new evaluation tool, participants will gain an insider perspective on gender-bias or sensitivity within games by examining the characterization, imagery and language, storyline and results of the game play. This entry was posted in Uncategorised and tagged gender in games, gender sensitivity, Panel Picker, SXSWedu, SXSWedu 2016 on August 25, 2015 by Lisa Chu. This entry was posted in Uncategorised and tagged Julie Evans, SXSWedu, SXSWedu 2016 on August 12, 2015 by Lisa Chu. Do you have what it takes to be a teacher? Three college students, all aspiring teachers, embark on a cross-country road trip of self-discovery and adventure and find real-life inspiration from educators, policy makers, social entrepreneurs, and activists who share their own roads to the classroom. We follow Nadia, Rafael, and Grace’s personal journeys as they contemplate their futures and begin to understand the vast opportunities, personal rewards, and vital need for passionate young people to teach. Join the Q&A after the film and discuss how to inspire the next generation to teach. This entry was posted in Uncategorised and tagged educators, future educators, SXSWedu, TEACH, Teaching, The Road to TEACH on March 10, 2015 by Lisa Chu. What’s the Best Way to Evaluate a College Graduate’s Skills? How should employers asses the critical thinking factors of recent graduates? Employers looking to hire recent college graduates typically look at the prospective employee’s cumulative GPA, work experiences and internships, but are these factors telling of the prospective employee? Some say yes, some say no. What do you say? KPCC, Southern California Public Radio, recently conducted a segment highlighting a test that aims to predict critical thinking factors of recent college graduates, factors that GPA and work experiences cannot measure as reliably, as CLA+ claims. CLA+ stands for the Collegiate Learning Assessment Plus test. It differs from other standardized tests and graduate school examinations, as it aims to specifically test critical thinking factors, and it is not a test you can study/prepare for in advance for a short amount of time. The CLA+ is given at the beginning of one’s college experience, and again at the end of one’s college experience. Some are skeptical of this test’s validity, and argue there is simply not enough research to tell if it works or not. How can a test accommodate for diverse college experiences, including varying majors and school involvement? Others think it could be useful in assessing a recent graduate’s critical thinking factors, something that is vital in the professional workforce. Recent graduates who called in during KPCC’s segment stated the test was unnecessary, as employers can judge numerous abilities and factors during a job interview, and did not understand how it was different from any other typical tests. Others called in and stated that students are over-tested, and a line needs to be drawn. For more information, listen to the radio segment here. You may see sample questions of what the CLR+ would entail here. As always, we’d love to hear your thoughts on this matter! Let’s get the conversation started. Don’t forget to vote for Project Tomorrow’s CEO Julie Evans’ panel at the SXSWEdu conference. Click the webtile below. Voting ends soon…September 6th! Registration for Speak Up 2013 is live! Be sure to register your school or district today! This entry was posted in Speak Up and tagged College, critical thinking, Julie Evans, KPCC, Southern California Public Radio, Speak Up, Speak Up 2013, SXSWedu on September 3, 2013 by Project Tomorrow.